Bill Prince knew his Chicago-area home was hit by lightning even before he saw the burned portion of his cedar shake roof. “It’s a very loud explosion and you know immediately when it hits because the concussion from the heating of the air shakes everything,” he says. Prince grabbed a fire extinguisher and headed to the attic, the smell of burned wood growing stronger. He called 911, and soon thereafter firemen using a thermal camera examined the roof and structural supports for any sign of fire, hidden embers, or hot spots. They didn’t find anything, but the lightning had hit a corner of the roof causing $20,000 in damage where the main roof support joist exploded. That happened in 2010, and after several years of exploring lightning protection systems, Prince opted to use air terminals–lightning rods connected by copper cable that run from the home’s corners down to the ground. The cable is buried approximately 10 feet underground. Once installed, the highly conductive copper and aluminum materials provide a low resistance path to safely bring lightning’s dangerous electricity down to the ground. 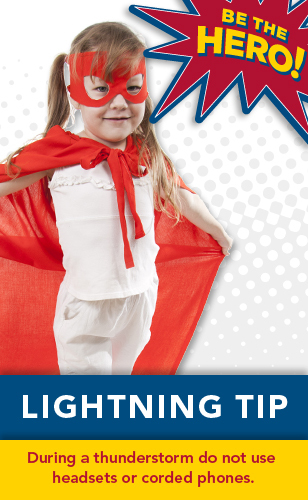 The goal of grounding a house is to take lightning’s electrical charge and shuttle it into the dirt. Prince’s professional installation was completed in April. Typical grounding costs between $1,500 and $4,200, depending on the size of the home. If you’re thinking your home is already is grounded, you’re only partly correct. A home’s electrical conduit in the walls and attic is grounded, but it’s not enough to withstand a jolt of lightning that can pack heat of more than 50,000 degrees Fahrenheit. Prince’s protection system adds grounding to his home’s piping and water system. And both circuit breaker boxes have surge protectors. Are these protective rods and cable unsightly? No. In fact, they’re quite unobtrusive and come in a variety of finishes and styles. On Prince’s house, the 12- to 18-inch terminals are no bigger than the diameter of a ballpoint pen and their copper color will oxidize and eventually turn to brown and match the color of his wood roof. The copper cable is tucked along the home’s downspouts and will turn to brown as well. When a lightning protection network is in place, a lightning strike is intercepted and directed to the ground without impact to the people, contents or structure. From June 22 to 28, Lightning Safety Awareness Week will bring national attention to lightning safety and property protection. 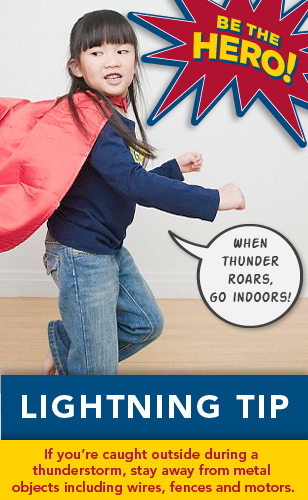 Learn more by visiting flash.org and lightning.org and remember, When Thunder Roars, Go Indoors! 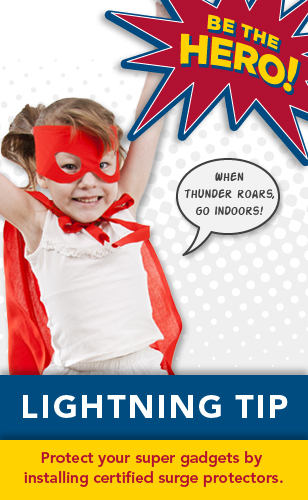 If you’re caught outside during a thunderstorm, stay away from metal objects including wires, fences and motors. We have one day left of #NATLPREP tips! Follow our National Preparedness Month Pinterest board. We are halfway through National Preparedness Month. Are you prepared? Visit our joint Pinterest board created with USAA to learn how to keep your family and friends prepared.